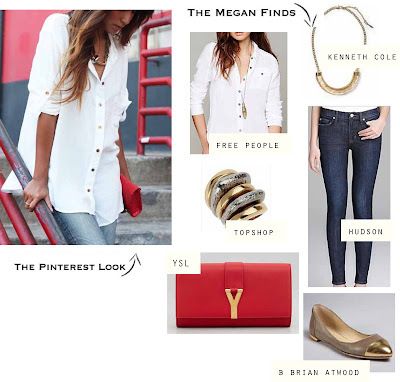 So I'm super into white button downs right now, you guys. I'm talkin' the big, loose, this-looks-like-my-boyfriend's-shirt-but-it's-really-not types. And not the traditional clean cut, cotton, freshly ironed type either. The type that looks nicer than a T-shirt, but less formal than a dress shirt. How did this recent obsession start, you ask? Well.... mostly just because it's super cute to throw on with a pair of skinny jeans, clunky statement jewelry and flats. It's appropriate for work because it's a button down, but it's also cute for happy hour because it's not your traditional button down. It says: I'm casual, I'm stylish and I don't have to try to look this good. Inspiration above! Awesome and wonderful collection of women accessories . How nice are the accessories are! Everyone should prefer from your wish list. You have a wonderful color combination collection of fall shoes, bag,and dress.I love to wear v neck t shirts. Great post and suggestion to select the products. All of them are looking amazing!!! !